Everyone loves a gift that is pretty and useful, and that is just what this uplifting mug offers. 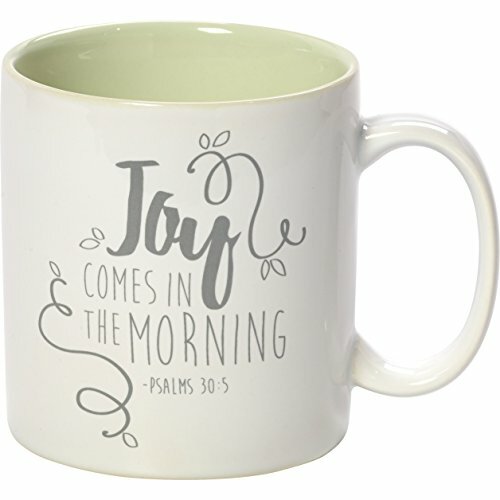 Quoting Psalm 30:5 “Joy Comes In The Morning,” this stoneware mug is the perfect way to enjoy a morning beverage while filling the first moments of the day with a quiet joy. A truly functional gift, it serves as a reminder of your thoughtfulness each time it is used. Pairs perfectly with other Bountiful Blessings mugs, trivets, pitchers and more to make an ideal housewarming gift, wedding gift, or holiday present, or give as a birthday gift or for any occasion. Crafted of stoneware and carefully hand painted, dishwasher and microwave safe. Approximately 3.5 inches high, holds 11 oz. Approximately 3.5 inches high, holds 11 oz.